These days the costs to refurbish or remodel a bathroom are dizzying. 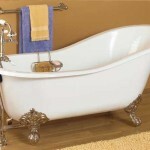 Old bathtubs become hard to clean and show stains soon after cleaning due to the worn out porcelain surface. 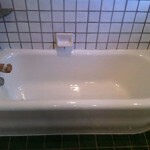 In lieu of removing a tub, damaging the tile and replacing it with a cheap new steel tub, many homeowners are choosing DIY bathtub refinishing to refinish their bathtub themselves. Some old porcelain tubs are extra deep and even if replacement were an option, many folks would like to keep that deep old tub. 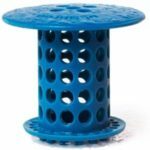 Do-it-yourself types have the option of using hardware store bathtub refinishing kits or for an even better product, purchasing bathtub refinishing kits online. Whilst the product quality and application methods differ, the basic steps for properly refinishing a bathtub are the same. You really do not need many tools to refinish a bathtub. 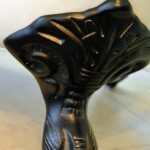 Some tools, such as an orbital sander, can be skipped by manually hand sanding. 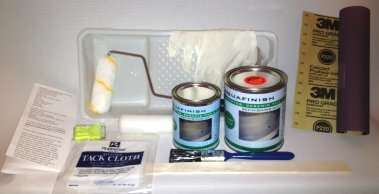 Here is a breakdown of what is needed to reglaze a tub. Turn on the ventilation fan in the bathroom if it has one. Open the bathroom window if it has one and place a fan blowing towards the outside (mask around the fan to seal it off from the window so air does not draw around the fan). If the fan will not fit in the window then place a fan blowing in at the bathroom door and use plastic to seal off the door around the fan to force air out of the smaller bathroom window. If you have no bathroom window, place a fan blowing out of the bathroom door into the home. Bathtub refinishing fumes are dangerous and you do not want yourself or anyone in the home breathing them. Always wear hand and eye protection. 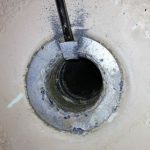 Remove the overflow plate from the tub and begin the caulk removal stage.Start by removing the caulk around the tub where it meets the tile surround. Take your utility knife with a sharp blade and start cutting at the caulk. Cut from above on the tile side and from the side on the bathtub side (vertical and horizontal cuts). Make a few passes and the old caulk will start loosening up. Take your putty knife and start working the caulk off as you did with your utility knife, from the tile side, and from the bathtub side. Do not worry about black tool marks on the tile or tub; these will clean off with lacquer thinner later. Now that the bulk of the caulk is off, take your razor scraper and start removing any residual caulk off the tile and tub. Afterwards, clean up your mess. Silicone will ruin your refinish job. If silicone caulk was used to caulk your bathtub, all of it has to go. Silicone residue is hard to remove and no refinishing product can adhere to the tub if any silicone is present. After removing all the caulk use a silicone digester and follow its instructions for use. Take your razor scraper and start scraping the tub under the soap dish area and the corners of the tub. Look for soap scum to start flaking off from your razor. Scrape the entire tub looking for soap flakes and work off as much as you can with your razor scraper. Scrape around the drain closely to remove any plumbers putty or debris. Use Barkeepers Friend as a scouring powder and scrub the entire tub with a green Scotchbrite pad. 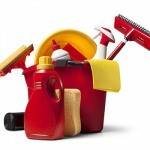 Using a sponge, rinse the tub thoroughly and repeat the scrubbing process again. 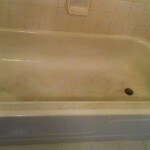 Cleaning the tub of all oils and soap scum is the most critical aspect of bathtub refinishing. Pay special attention around the drain. This is the highest failure area. After rinsing the tub, inspect for any caulk, silicone or soap film that was missed and remove these contaminants. Afterwards, dry the tub well with your paper towels. Now is the time to make any repairs to the tub. Lay down a few sheets of masking paper in the bottom of the tub and mix up some polyester filler such as Bondo or even better Evercoat or Dolphin Glaze. Use a putty knife or bodywork spatula and apply your glaze over the chips or other defects in the tub. Let this dry a few minutes and then gently sand off the excess. Repeat if necessary. If you are etching the tub in acid, etch before repairs. 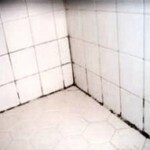 It is not a bad idea to apply some bonding agent to the repair areas before making the repair. Dry the tub well with paper towels making certain there is no water under the outside edges of the drain. Using your orbital sander or by hand sanding, begin sanding with 120 grit paper or sanding disks (put your respirator on first). Sand any rust areas and sand the dirty overflow area. Sand the corners of the tub and where the tub meets the tile. Sand the entire tub down well. Take a paper towel and wipe all of your dust towards a back corner of the tub away from the drain. You can tape down a piece of masking paper to use as a “dustpan” and brush your dust onto it, wad it up and discard. 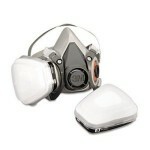 Put on your safety gear: gloves, respirator, and eye protection. Begin soaking a paper towel with lacquer thinner and start wiping down the tub and immediate tile (make certain there are no sources of ignition in the room like open flames or smoking). After waiting for any lacquer thinner to dry, begin masking off the tile with 3/4″ or 1″ masking tape. Mask all the way around the tub and floor in front of the tub. Mask the drain by applying tape strips over it and then cutting around the drain with a sharp razor blade and removing the excess tape. Take your masking paper and re-mask over your tape with more tape and paper this time. Place a latex glove over the faucet and the shower head. They will decide to drip in the middle of your refinishing job. After masking your tub, it is time to apply the bonding agent that came with your bathtub refinishing kit. Apply your DIY bathtub refinishing product. Take your tack cloth and make certain you have cleaned out all the dust in the tub. Put on your respirator, gloves, and eye protection. Before refinishing your tub, mix your product together referring to the included instructions. If you are not using a spray gun then cut in your corners, along the tile, and around the drain with your included brush. Use a fine foam roller to apply the product to the rest of the tub. Bathtub reglazing kits may have varying directions so read the application instructions that came with your kit. If in between coats you find that you have a run, wait for it to dry a bit and then wet a latex-gloved finger with lacquer thinner and gently rub it out, keeping your finger wet. 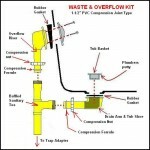 After a few minutes of completing your product application, remove the masking on the drain. Wait a few hours (not days) to remove the remaining masking. You risk grout trash and dust falling into the tub when removing the masking. Make sure the tub is dry enough so if any dust falls into the tub it is not going to stick. If any dust does fall in, don’t touch it until the next day when the tub is fully dried. Wait a good two days to replace your overflow cover. If the overflow cover is ugly, you can pick one up at the hardware store for a small cost. 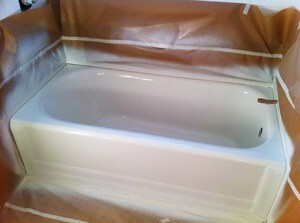 After waiting a day, you can then re-caulk your newly refinished bathtub. Choose a non-silicone caulk with anti-mildew properties such as this one from DAP. The color “biscuit” is a better match than pure white. You can also choose Loctite Polyseamseal but make sure the tub is fully dry. It is easier to control the caulk using the squeeze tube. Cut off just a small bit of the tip at the recommended angle. Apply the caulk and then put on a latex glove and smooth the caulk with your finger. Hold your hand as flat to the tub as you can while smoothing the caulk. Bathtub reglazing is not difficult. Just make certain the tub is as clean as possible before any product goes on! 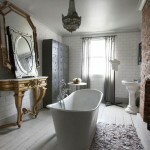 Getting started professionally refinishing bathtubs? Get the highest stage HVLP blower you can afford. 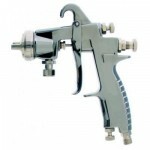 Read more about HVLP spray guns here. Set your HVLP gun fan at 6″ to 8″ and shoot from about the same distance. Turn your air pressure to the lowest you can, but keep a good atomizing pressure. Never over-reduce your products. It never helps and only makes for runs and rough tubs. Do not reduce with cheap lacquer thinner. It is usually contaminated with water. Lacquer thinner as a reducer makes tubs lose their gloss in a few months. It is for cleaning your gun only. Do not skip cleaning the tub and then cleaning the tub again. One coat of topcoat is never enough. Always use a measuring mixing cup. Always use a check valve on your gun. You cannot clean a tub with lacquer thinner. Always mix and strain your material before it goes into your gun cup. Silicone and soap film is the enemy. No matter what you think your over-spray will be, always plastic off the mirror, vanity, and toilet. Even though it is a pain to set-up, always get out your extraction fan. It helps with trash in the tub and dry spray on surfaces. It keeps you from running out of the bathroom after a coat, quickens flash time and keeps your customers away from fumes.